Are you using imgur? For some reason, I can never see pictures from there. I am. You can't see pics at all??? What do you see then? A broken image? Nothing? I used Photobucket before but they started putting in watermarks so I stopped using them. I did post them on Twitter, so I could just C&P the links from them. I do follow you (and Axel) on twitter (though I don't really use twitter), so I can just look there. Sorry about your forgotten pears. I just don't like the watermark. Just a quick pose. I can't do anything elaborate right now. 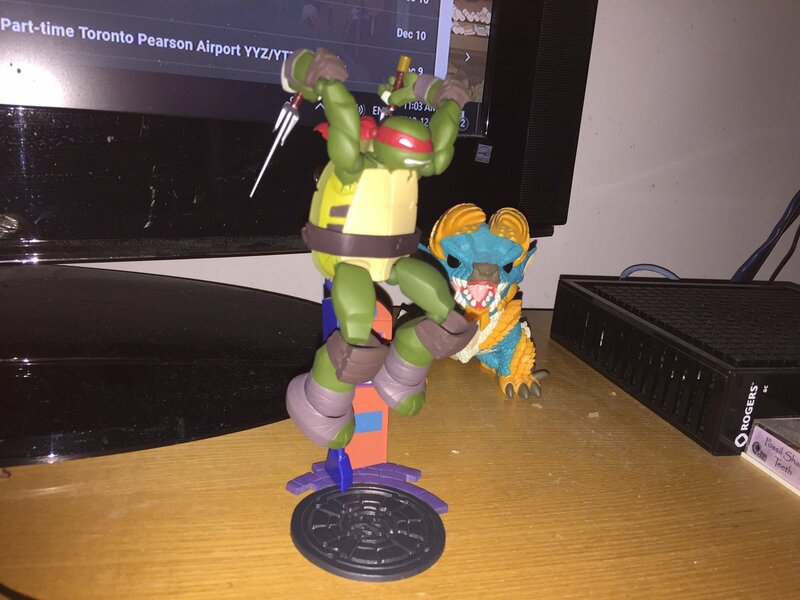 The pose I'm using for Raph currently on my PC desk. It makes more sense to have him in the air though. I may use the prop for that. Fishing line or white thread also works pretty well. I have a Mothra figure dangling from my ceiling by that. But the figs come with their own cool looking props for midair stunts :3 I haven't used their alt heads yet. Here we go. This is more like it, mewmew. Viola mewmew. Here is a group shot of them all ready for action! 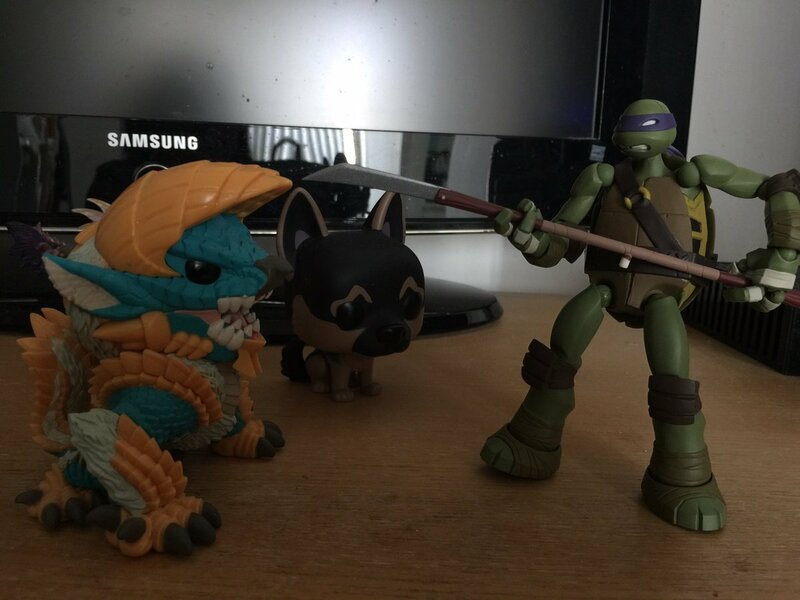 I love these figs! Just have a few issues with them. Yeah, but the props are so obtrusive. Or intrusive. I'd grimace too if I had a stick up my...shell. Meeeew. You can pretend they're leaping off whatever prop they're propped up on. 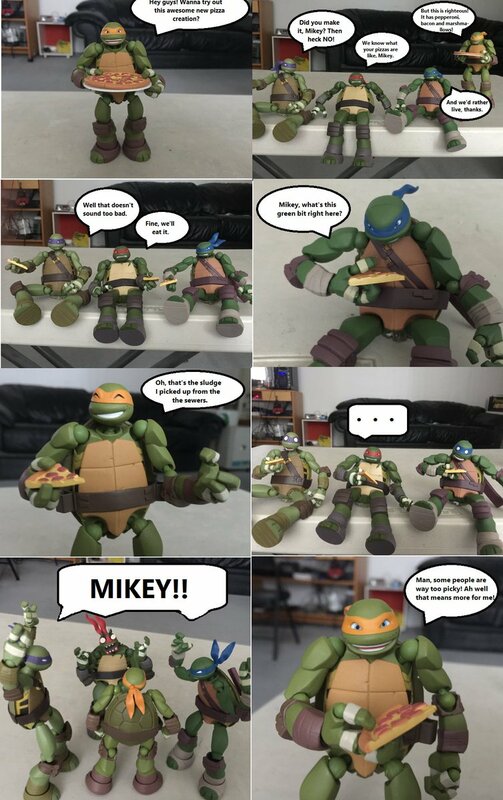 I made a comic with my figs. 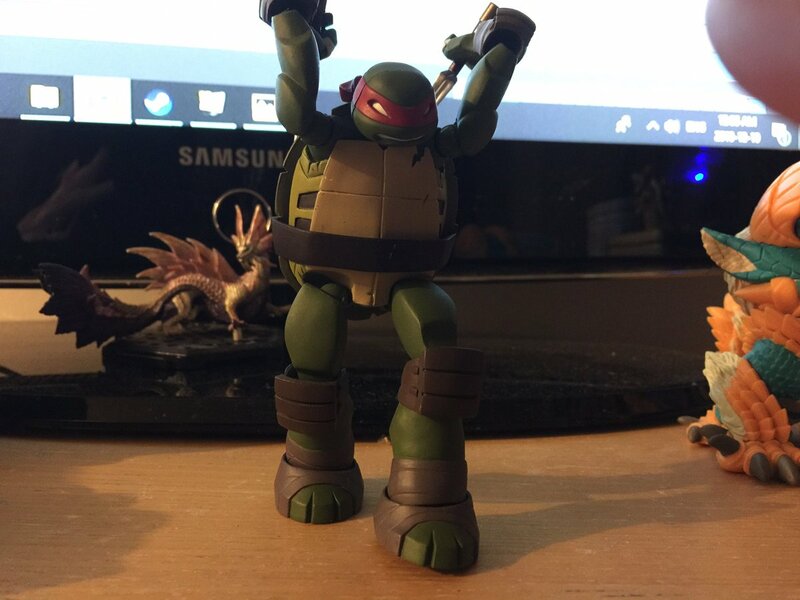 Nobody's gonna notice it, but Raph is flipping off Mikey with both hands. I still haven't across across The Oregon Trail at Wal-Mart. I may have to settle instead for the AtGames Atari paddle system, but I'm not sure it will work for me. I assume these AtGames Blast systems are dongles you plug into a powered HDMI port, but I don't know if my HDMI ports are powered. I really rather doubt they are since my HDTV is very old. Considering going back as well and buying the Peanuts holiday collection on Blu-Ray for $10, but still debating it. I hid one of the three copies they had the other day to think it over. If one of Jeremy's colleagues hasn't noticed it yet and I can successfully relocate my hiding spot, it should still be in the plumbing section of hardware where I left it when buying a new trap for my kitchen sink. The thing is that they were remastered again afterwards with a significantly superior transfer and better video encoding, and came out on UHD Blu-Ray. I want those, but I don't actually own a UHD Blu-Ray player yet. Not sure it's worth $10 for the old Blu-Ray's when they're guaranteed to be obsolescent for me relatively soon. We got a PS VR as an early Christmas present today. The new-ish Megapack, more specifically, which includes Astro Bot: Rescue Mission, Doom VFR, Wipeout Omega Collection, Skyrim VR and Playstation VR Worlds, for €220 instead of €330. All digital games, so downloading them will be fun. I didn't have time to figure out if I actually wanted it or not (or a say on the matter at all) before they rushed to buy it, but whatever. Most of my experience has been with VR Worlds, which has terrible, terrible textures -- like early 2000s PC games, to make a bad example -- and pop-in issues, and is just really boring all around (at least my sister and especially my mother liked it), so that wasn't a good first impression at all. Several hours later I was finally able to play a tiny bit of Wipeout and the Zone of the Enders 2 demo, though, and both were really, really good. The only sort of VR that I ever tried was the old Sega game Sub-Roc. Not really VR, just 3d. But I have a lazy eye, so neither really works well for me. Very cute. But if you were really determined, you could go Ray Harryhausen and make movies with the figures. I did that with a godzilla toy I had as a kid. I want those, but I don't actually own a UHD Blu-Ray player yet. An Xbone S is a UHD Blu Ray player. In theory, at least 3 times a day an employee will straighten up every aisle (it's called zoning) and grab anything that's not supposed to be there. In practice, who knows? I've been thinking about getting a new TV. I have a 33" 1080, but we have some 43" 1080s for like $170. That's about as big as will fit in my living room. Cool photos, Freelance. You should play around with the lighting in your shots. When I photograph my figures, I usually go for moody, dramatic light-dark contrast. The The Oregon Trail handheld is, or at least initially was, a Target exclusive. It's printed as such on the packaging itself, though I've also seen a few (at Target) with more generalized packaging. As for the AtGames Blast! systems, they are powered via USB. The dongle plugs into an HDMI port, but the dongle itself has a micro-USB port, and you can use a micro-USB-to-USB cable to connect that to a USB port on the TV (or to a USB-to-wall-socket adapter). See https://blast.atgames.net . But I have a lazy eye, so neither really works well for me. My geometry teacher in high school had a lazy eye. Which eye is your weaker one, and what do you see out of it? And no, I'm not expecting you to say, "Other dimensions." My right eye is lazy. Basically I see double of things closer than arm's length. The The Oregon Trail handheld is, or at least initially was, a Target exclusive. Yeah, but Freelance bought her Oregon Trail at Walmart (there not being Targets in her part of Canada) which made us look in ours. Technically Walmart Canada is a different company from Walmart US, but they are related. My left eye is a lazy eye. Basically only good for peripheral vision since the quack doctor never caught it as a young kid. Wasn't discovered until he died and my new eye doctor discovered it, but I was a couple of years past where the eye patch deal usually works. I knew about it, but didn't know how to express what was happening, or know that it wasn't normal. So I sadly kept my mouth shut. Still hard to describe what I see out of it. Things look sharp, but at the same time I could be standing five feet away from 10' tall letters and not be able to tell you what letter they are with any degree of confidence. Nice to know about the AtGames Blast system. I know it didn't go over well at AtariAge, but I'm not as picky and the AtGames prejudice is making people make mountains out of molehills. I think I can deal with the odd filter they're using and a slight bit of input lag and even if it ultimately stinks, I'm curious to see it for myself. Alas, I don't have the ability to make much changes with the lighting. I tried to make a moodier pic where all you see is the whites in their eyes, but it was too dark and I couldn't see anything at all XD Oops. Making a video comic takes too much time that I don't have. Maybe paint their eyes with fluorescent paint, then get a black light. Does anyone have a 4k TV? They're like $275 vs $170 for a 1080p TV, so it seems like it might be worth the extra $100 or so to get one. But then again, maybe not. I don’t have any lazy eye but my left I think tend to veer off in the other direction. I'd honestly rather have more money than a slightly-better-looking TV, but then again I don't really know how 4K looks, and hey, it's your money. My grandmother had an ischaemia last Sunday, and no one bothered to let us know, not my grandfather, not my uncle. She had to do the call herself a day later -- she was surprised she was the first to tell us, too. She got bounced from hospital to hospital, and she's slowly recovering the use of her arms, but at least she's alive. My mother has gone to check on her today. She decided to go on her own, for several reasons. Good to hear she is recovering. I had not seen the word "ischaemia" before, but based on what Wikipedia says about it, it sounds frightening. No 4K TV here. Besides, at a size that would fit, I don't think the resolution difference would be visible without sitting only a few inches from the screen. Alas, I don't have the ability to make much changes with the lighting. I didn't mean anything complicated, really. I'll try later to show you a shot I took just using a desk lamp. Even that can give you some nice contrast. My right eye is lazy. My left eye is a lazy eye. I could be standing five feet away from 10' tall letters and not be able to tell you what letter they are with any degree of confidence. Was that supposed to be 10" letters? I thought about being 5 feet from 10-foot letters, which does sound difficult to read, but not for sharpness reasons, just field of view. Then again, maybe I misunderstood, and that wasn't meant to illustrate sharpness problems? This might be the last you guys hear from me until after the holidays, so Happy Holidays and end/start-of-year festivities to everyone! I hope onmode stays safe of going to see family driving through inclement weather. Hospitals are really, really, really, really awful places. It's probably best you don't go. I remember when I was like 16-17, my favorite Great Aunt was very sick in the hospital. I wanted to see her, but she didn't want me to. I was irked at the time, but then when I went through what I did with my mother and then father, I'm glad I didn't. Same reason I never called my mother's sisters when she was there. They'd just get my mother upset, they'd get upset and nothing good would come of it. My secret Santa at work bought me a Xbone Charge & Play kit. Which is funny because I was literally going to buy one today. Aaaand all of us went there yesterday. Besides the unbearable smell and the suffocating heat, it wasn't bad. My sister fainted right in front of me (probably because of the heat) and that was horrifying, but other than that, it wasn't bad. Then again, our parents spared us from the worst trips, which I'm thankful for. Now, that one time I went to the emergency room back when I had chest pain, that was really really awful. I second or third the hospital crap. For me it’s due to my grandfather passing right before my 7th birthday. 3 days prior. And I can’t forget the day he just laid down, I was doing my summer homework and grandma was washing the dishes. I had the weird feeling it’s all downhill once I hear the medicine she tried to make him eat wouldn’t go in. They sent me to a family friend and a few days later I was told he died. Saw him at the funeral wheeled away in a glass casket I think. He looked a bit purple. That was that. Distain for hospitals since then give or take. I hope everyone not stress out much over the holidays. Just try to take it as best as possible. Happy holiday my dysfunctional peeps.